Photos won’t do these totally awesome “comfier than sandals” shoes by Sanuk. We’re currently down at the beach and we’re admittedly moving in slo-mo mode meaning everything’s very casual and laid back. When my brother in law came back from a trip to our favorite store for clothes (B&B Department Store) wearing a pair of these Sanuk shoes, I knew we needed to get a pair for hubby. 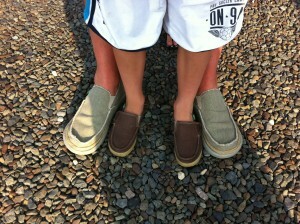 Hubby’s wearing a pair of Hey Jute ($60) and Nate (age 7) is wearing the Standard Kids ($42). Check ’em out. They make stylin’ looking flip flops too. 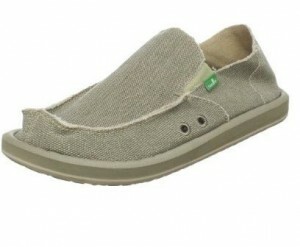 You can buy on the Sanuk.com website, on Zappos.com or Amazon.com. Boy, are they ‘spiffin’ on down or what?!!!!! When do you come hooooooooommmmmeeee? Julie – this weekend! Boohoo! I could live here forever ðŸ™� And yeah they are so OBX style, surprised they weren’t there!